there's a well known, and widely quoted quote from h.g.wells 'when i see an adult on a bicycle, i do not despair for the future of the human race'. perhaps when wells said this, it wasn't possible to purchase bicycles for kids, because if the man had been down at port charlotte's port mor centre this staurday morning, he would surely have had even less fear for the human race. 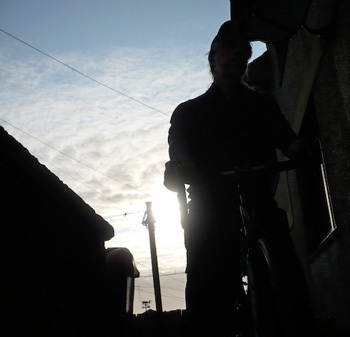 in the follow up to britain's incredible success in the velodrome and on the road at the recent beijing olympics, i was won't to put fingers to keyboard and urge all and sundry - or at least those with an interest and the wherewithal - to encourage the youth of the planet to get on their bikes and have some fun. and uncharacteristically, i have put my pedals where my html is. well, jez and i have equally done so, he more than i because port mor wheelers was started two weeks ago, and at the time, i was otherwise engaged. so this week was my first week; and the enthusiasm of the kids would have brought a tear to bernard hinault's eye. in the first week, despite there being swimming lessons, football and the annual book festival on at the same time, jez had attendance of 16 kids. this weekend, we had twenty. bear in mind that the total population of islay is around 3,500, much of which comprises retired folks, and that two primary schools have closed in recent years. those are impressive numbers by anyone's standards. 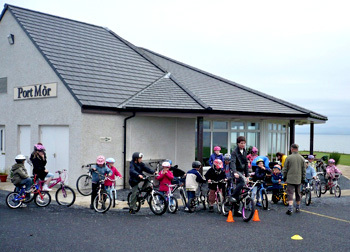 jez and i undertook a day's training around a year ago with davie the snake from mull, who put us through all the necessary ins and outs of keeping a bunch of kids safe, happy and interested; the idea is to have fun on the bikes, to learn without really being aware of it at the time. this is all set out in a scheme known as ready steady bike operated , in our case, by cycling scotland, though there's probably something similar wherever you live. this has the kids cycling in and out of cones, giving each other high-fives while cycling in opposite directions, going round in circles, slow bicycle races - you get the general idea. all it actually needs is a bit of enthusiasm on the part of the trainers (and we have bucketloads of that) and an ad in the local paper. we don't charge any money for the two hour session, but then we don't actually have any costs: june graham at argyll and bute road safety department presented us with a big lime green and black travel bag full of cones, hoops, reflective jackets and manuals - even books we can hand out to the kids. age limits are from five upwards and as i have mentioned probably too many times already, the idea is to have fun. send home some happy kids, and they'll tell their friends, and there may well be more in two weeks time. it's worth my passing on grateful thanks to graham hayes for his assistance, to adam and eleanor who are over here for a couple of week's cycling holiday, and who we roped in to help with a cyclocross demo, and to the other adam who insists he's only the second best bmx rider on islay. he provided the cool factor (remarkably well, i might add). thanks also to francois of bon appetit catering at the port mor centre who provided coffee for the instructors, and apple juice for the kids. we did it - now it's your turn. 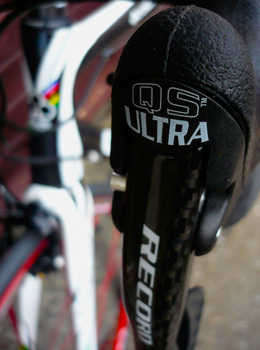 regular perusers of these pixels will doubtless be well aware of my predilection for colnago bicycles. i'd love to be able to explain why specifically colnago, but i really don't know, though i'm ever so glad it's the case. and part of that ever so glad is the amount of information, support, and sheer friendliness that comes my way from colnago uk and colnago in cambiago. much of this has to come from the fact that ernesto colnago is still very much at the top of his game and, at the age of 76, still the biggest cog in the colnago machine. however, ernesto is in italy, and i'm still sitting on a small scottish island off the west coast, so we don't talk much. in fact, we don't talk at all, since ernesto is not a fluent english speaker, and my italian amounts to little more than the words colnago and campagnolo. but an interview with ernesto seemed something that would enhance my understanding of where he's at today, and hopefully yours too. 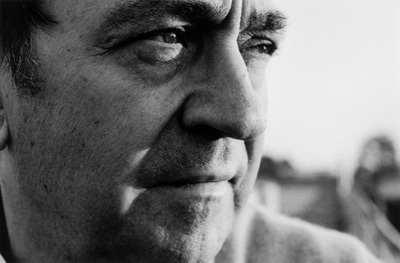 however, the excellent alessandro colnago manages both languages with consummate ease, and readily agreed to in and out translations between my questions and ernesto's replies. and both gentlemen carried this out with commendable speed. 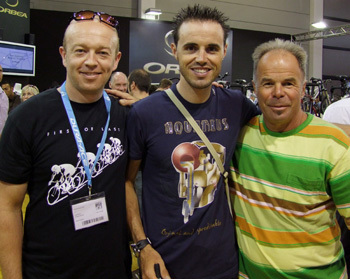 so here's ernesto's interview preceding my eventual review of colnago's latest eps frame within the next week. naturally, it takes pride of place on colnago.cc, but the interview is just as much a part of thewashingmachinepost. mrs washingmachinepost and i have one of those very nice flat panel tv screens, not because ostentation is our middle name, but because the cathode ray tube in the last one started to see colours in a different way than most human beings, including us, are want to do. and plugged into the back of it is a satellite box, giving access to more channels than you can count on the teeth of a pair of chainrings. no different from thousands of families all across the world. however, i'm not that much of a tv addict myself; i'll watch any amount of cycling that eurosport, or indeed, itv and bbc care to send my way, but i don't really pay attention to very much else. mrs washingmachinepost, however, has to have her soap operas: emmerdale farm, coronation street, eastenders, and while my daughter was staying at home, neighbours and home and away. makes me wonder why i send bskyb so much money every month. during the moments whle all this dross (did i say that out loud?) is on the tv, i'm sitting, head down, typing feverishly to fill these pixels. however, i am not immune from my own serial addictions. at the end of almost every week, a pleasant e-mail newsletter arrives from rapha, announcing the latest product, how the race team is faring, any forthcoming events, and the rapha continental. and that's what i'm waiting for. the continental is a long-term project that rapha usa embarked on last year, initially assembling a bunch of cycling characters from the northwest to ride the great unsullied rides that america offers the intrepid pedallist. some are just like you and me (daniel? ), while others like ira ryan could cheerfully fulfil the slogan tested by animals (i mean that in the most respectful way, ira). but being rapha, this has not been done in a casual fashion - much organisation, finance and enthusiasm has been poured in to the continental project. granted, the ultimate aim is to position the clothing in front of the cycling public, but this is done in such a low key way, that you'd be forgiven for sometimes thinking they'd forgotten to do just that. of course, rapha are not the only ones involved; chris king have manfully stepped in and provided headsets and wheels, while the various handbuilt frames are endowed with brooks leather saddles, meaning that there are no excuses on the equipment front, as the riders tackle completely unheard of places. well, unheard of if you're sitting on a small scottish island at the edge of the atlantic. stephen's pass, six gap, walden pond, dufur, cloudburst... the intriguing list goes on. and it's all fabulous stuff that easily lives up to the mental pictures such names imply. but there's where the continental scores big time: no mental pictures are needed. each ride is photographed in the finest rouleur fashion. observations that you and i would probably miss, pictures that make you realise why rapha want to do this, photographs that let us see just what incredible space there is in the northwest and (subsequently) the north eastern united states. but the words have not been missed. much of the writing is handled by daniel wakefield pasley a fine wordsmith who proffers the same degree of observation and style as offered by the series' photographers. and it's addictive. a bit like waiting for the next issue of rouleur (rather than the next episode of coronation street). the last ride was that of stephen's pass which went online last week (when the newsletter arrived), but the next one, in the enticingly named snoqualmie falls, doesn't arrive until 26 september. what the heck am i supposed to do until then? well, in my case, i'm going to re-read and re-look at some of the rides already there, because that's the way it works. rapha's intention is to catalogue all these great rides and have them in one place for all to read and look at, even if only through the magic of a web browser. if you fancy trying these for yourselves (i'm talking to those of you in north america here - mrs washingmachinepost would probably notice if i was away that long on a sunday morning) each ride finishes with a map of the route followed, available as a pdf download. slate olson, rapha's north american supremo, has alluded to these making their way into a book sometime next year, and i have my name down first on the list. 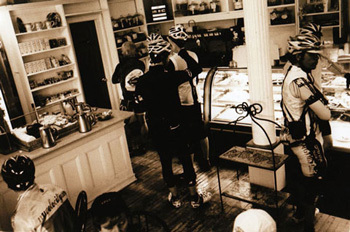 if you haven't already made it as far as this part of rapha's website, you are really missing out. there are more of us on bicycles who don't race, feel we are too old to race, or have no intention of ever racing than those who do, but we can still enjoy the beautiful thrills of epic cycling, inspired by the efforts of the band of merry men out of portland. even if we're nowhere near the place, and without the tenacity of ira ryan. i dread to think how much money rapha must have poured into this epic journey, but i'm quite sure that it's not all pure marketing. it costs nothing to read, nothing to subsequently ride, and there's no compulsion to wear anything with the rapha logo embroidered on it. maybe my addiction pervades over time, but that's me, and what's to lose if it enhances the fun and pleasure i gain from cycling; it doesn't have to apply to you. but i bet it would if you read it. before i had the knowledge i'd like you to think i have, two steel road bikes my way came - a red 531 which was replaced by a 653 frame of similar manufacture (well, exactly the same really) after the red one had its top tube dented when a pedal fell off the shed roof (don't ask). the 653 was painted in the nearest colour the guy in the paint shop could manage to bianchi's celeste blue/green, and he made a remarkably good attempt at it. the downside was the quality of the paint; not only did it start to flake around the edges, but it faded quite dramatically in the blazing islay sun. not long after, colnago fever took hold, and for me, the world of cycling was never the same again. fortunately (as i would have you believe) i have maintained a healthy sense of self-deprecation as regards my colnago obsession; i am well aware that there are fine machines deployed by many other european and north american frame builders, and at the prices we're talking about here, nobody makes crap. however, i still keep at least one eye (the left one) on what everyone who is not colnago, is doing, and the one thing that many are doing that colnago isn't (sadly) is producing rather fine cycle and apres cycle apparel. the two fellows who have apparently signed for the weightwatchers team for 2009, colloquially known as mick and andy from prendas ciclismo, have managed to acquire what is undoubtedly one of the finest looking winter jackets to appear on the market. and that praise applies whether you happen to own/ride a bianchi or not. sadly, in this case, i do not - and it would would be very unseemly to be seen pedalling around the estates on a fine colnago eps (yes, it's still here) wearing a celeste blue edoardo bianchi winter jacket. but that doesn't mean i'm not tempted. if you own a bianchi, cycle past a bianchi dealer on the way home, or own a bicycle that's painted a vaguely similar shade of blue, then click over to prendas and place your order in time for celeste style in the face of cold weather. 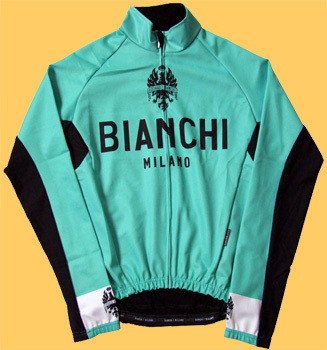 the jacket sells for a worth every penny £99.95 ($178) and if you're quick, you can order a pair of bianchi bibtights at the same time and save a tenner (regular price for the latter is £85 ($152)). in order to feed habits, obsessions and family it is entirely necessary to have a job, or something akin to employment - something that will empty enough money into the bank account to afford carbon, alloy, rubber and, occasionally, food. and some of us are extremely lucky in that we actually enjoy what it is we do to ensure such income, while others endure abject drudgery, crappy shifts, serious boredom or even worse, using a windows computer. then it's just a case of living for the weekend. the downside to this is often the other chores that rear their ugly heads on saturday and sunday, eating voraciously into the mental time we had set aside for endless, joyful pedalling. you know just of which i speak; kids need to be taken swimming, dancing, horse riding, music lessons, grass needs cut, garden needs weeded, rooms need wallpapered... it's a wonder some of us ever see our bicycles from one year's end to the next. and of course, many of the above chores and visits take place during the summer months when (allegedly) the finest cycling weather makes itself known. so what's a cycling fanatic to do? so what to do about it? i'll admit that i'm coming in at the tail end of the season often laughingly known as summer, and generally the weather prognostications are less than favourable for any outdoor hobbies/sport (with the possible exception of golf - there seems to be more folks out hitting that little white ball in wind and rain than is considered sane) in the coming two seasons. but literary output is no observer of surroundings, so it may as well be now. a fellow i used to work with many a long year ago, pointed out that we spend an average of 84 percent of our waking hours at work. if that still holds true, that doesn't leave a whole heck of a lot of time for cycling. bearing all of the above in mind, start taking a few extra steps to punch a few more quality kilometres into each day; start fitting work around your cycling. and don't just chuck it in to fill the space - make sure those extras are fun, fast, slow, happy, or anything else you want them to be. if you commute even now, add an extra loop. if the bike's ageing, fear not; buy a new component every now and again, and soon it'll be more new than old. if you're already reading thewashingmachinepost, you're beyond saving anyway. fixed is a state of mind. you can take it from me; i say this as one who couldn't pedal a non-freewheeling bicycle with one gear, if my life depended on it. this should alleviate the anxiety of all those who have a) never ridden fixed, or b) never quite managed to get the hang of it. and what's wrong with freewheeling anyway? it doesn't stop those of us who fit into the previous categories from being wannabe couriers, or cool laid back pedallists, even if it's only under our rapha caps. therefore, bearing in mind this confident attitude that we have now adopted as our own, there is no reason in the whole wide world, that we cannot wear items designated as fixed with as much aplomb as those who really do only have one gear. so when perusing the rapha website and discovering the new fixed jersey, there can be no excuses for not clicking through to check which size and colour would suit best. every iteration of this jersey has varied the colourway, from black, to sand, to light blue, to navy blue and black again. with one or two others in between. but this time round, with no change in price, it has encompassed the full range of versatility that we never even expected. 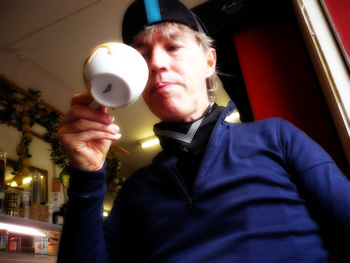 the old and unimproved fixed jersey featured mildly crinkly merino wool, a quarter zip front and centre, and that relaxed, off the bike having a double espresso at debbie's while connie's tidying out the wholefood section, look. and it was great; you could comfortably wear it while visiting clients, or attending exhibition previews (even jazz concerts) along with a pair of (here's that attitude again) fixed shorts. or maybe touring shorts if the weather and surroundings allow. but like almost every number one version of everything ever produced, it still offered room for manoeuvering by rapha. and manoeuvre they have. as mentioned, the new version is available in black or navy blue (tested) and features deliciously smooth, fine and comforting 100 percent merino wool, which can still be chucked in the washingmachine when it needs to be (i know, i've already tried it). it has become more jersey like by two improved measures; instead of simply a front and back, rapha have added side panels, similar to those you would find on a race jersey. this has quite subtly improved the fit without making it look as if there ought to be sponsor's logos across the front. but the masterstroke is the addition of three pockets across the back. why weren't they on version one? well, it depends on how far you want to proceed with the fixed idea. some dyed in the merino wool, one gear purists, would see rear pockets as superfluous as derailleurs; but as i pointed out at the top of the ladder, fixed is now officially a state of mind. and that state of mind is more than willing to accept pragmatism over purism; three pockets are just ginger peachy as far as i'm concerned. sadly, pockets on the back of a wool jersey can often result in the tail of the jersey dragging on the back tyre as soon as provisions, stowaway jacket, multi-tool, pump and spare tube are stuffed therein. if you're going to test new and improved, overdoing it is the name of the game, because at sometime, someone is going to do exactly that. now let's not tell fibs; all the above, plus a panasonic digital camera did bring the jersey further towards my bum than would have been the case if i'd only carried a tyre lever. but it didn't reach the back tyre, retaining merino style on and off the bike despite the cargo. and removing all from the pockets had no lasting effect, even after washing. i did the same again for a second time with similar results. the sleeves are a superb length, allowing wrist coverage even when stretched over a long carbon top tube, and the jersey feels softer and more luxurious than its ancestor, with the same zip length and collar height, so that you can look like a cyclist when zipped up, or a cyclist when open to the chest. i wore this on the sunday peloton ride with velo club d'ardbeg (lycra shorts), and again today to visit two clients in their homes (fixed shorts). try teaching photoshop wearing a garmin chipotle jersey. in this case, new and improved really does mean what it says on the tin; only £85, available in small to xxl, and it still has that completely necessary fixed label sewn inside one of the three pockets (which, for one horrible moment, i thought had been dumped in this edition). assuming you can get the hang of the fixed attitude of mind - and i suggest you try very, very hard - part two of the equation is simply one click away. just like real cycling publications, thewashingmachinepost is recipient of numerous press releases relating to the cycling world all about us. in most cases, true to the genre, these have to be slightly re-constructed to resemble everyday english, and to prevent the sender from convincing all and sundry that the subject of the release is the greatest thing since sliced bread, truly innovative in its field, and easily affordable by all. however, in this instance, the press release received was probably better than i could have managed myself, so i have reprinted it as it arrived from portland. "there is no doubt that tim has the capacities needed to attend secondary school. Intelligence and self-sufficiency are both at the requisite level. this self-sufficiency expresses itself in the desire to find his own way, and in a reticence to accept help. tim is not particularly childish, and any lack of knowledge is one he can compensate for at secondary school by means of his facile and penetrating powers of comprehension...it would be very good for this little boy if the definitive secondary school choice between secondary schools could be postponed a few years.tim is excellently suited to be a professional [single speed cyclocross] racer. 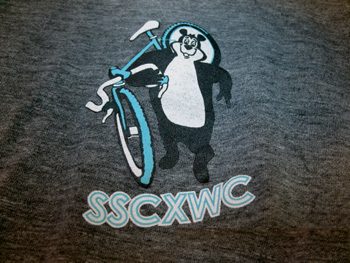 after months of lengthy conversations with the uci, the ioc and several hollywood studios, the sscxwc is back with a vengeance. 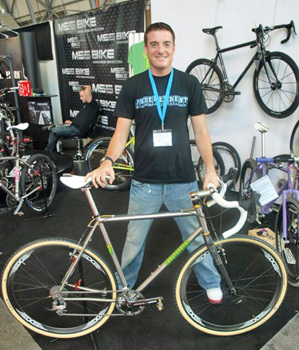 the 2008 single speed cyclocross wc (we can't say world championships) converges on portland once again. While negotiations are still on going as to whether single speed cyclocross racing will replace figure skating in the 2010 winter olympics, the promoters are confident that this 2nd running of event will be the decisive nail in the coffin. with qualifiers and surprises the likes of which have never been seen in organized cyclocross, the event promises to be the most talked about race of the year. again. on the second weekend of november (11/8-9) the saga continues. saturday 11/8 there is a qualifier with one main rule: you must qualify on the same bike as you race on sunday. this will be a time trial style qualifier. a last chance qualifier will follow the time trial for the last slots available for the wc (be ready for anything). if you don't make the cut on saturday, a second opportunity will be available during the cross crusade races on sunday. sunday 11/9 champions will be crowned. using the same course as the cross crusade race, the sscxwc08 race will present characteristic variations required by single speed cyclocross rules and wc guidelines. it will be a 60-minute race for men and women. any single speed bicycle with brakes is acceptable. note that all courses are designed with cyclocross bikes in mind. regular habituents of thewashingmachinepost will perhaps remember my first foray into islay's world of precipitation while wearing the chili pepper red, showers pass elite 2.0 waterproof jacket, a trip that was met not with the soaking rain i had rather hoped for. while the jacket proved to be convincingly windproof, comfortable and certainly breathable enough for those of an active disposition, it was never tested in the waterproofing department. considering that such is the raison d'etre of showers pass, this was somewhat of a disappointment. shortly after releasing my initial review of the elite, undertaken in certainly stormy, if dryish conditions, showers pass owner, ed dalton, e-mailed to point out a rather blatant faux pas on my part as regards the dampness of both arms while testing the breathability. each sleeve ends with an adjustable velcro (or, hook and loop if we're being blue peterish) fastenings, which i had, of course fastened to the utmost in the hope of repelling unwanted cold air. of course, it makes perfect sense to do the opposite while trying to cool the arms; the heat generated while pedalling at my normally seriously fast rate would pressure any cold air away from such inlets. and just to add insult to injury, my reviewing credibility took a further bash when, on this second attempt to get wet (believe it or not, unlike much of the uk, islay has suffered from almost a total dearth of rain in the intervening period, rather limiting any serious testing) i discovered a waterproofed zip under each arm, allowing serious intake of cooling air without fear of getting wet. monday morning (today, in fact) dawned gratifyingly and persistently wet - the ideal time to drag the colnago eps from its sheltering bike shed, and hare round the principality in a hopefully vain attempt to get thoroughly wet. while the full review of the colnago will surface in the fullness of time, i doubt that it's giving away too many secrets to state that it is a bicycle that almost forces you to emulate it's first customer: erik zabel. 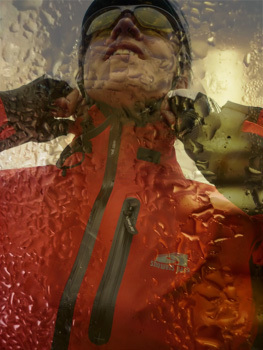 such frenetic pace through continuing heavy rain will always produce a degree of heat that will test the breathability of the best on the market. about half way round, i was beginning to feel the heat, so i opened both under-arm zips all the way. such is the anatomic design of such, that there was absolutely no ingress of water no matter how i grabbed the bars. drops or hoods. the longer tail of the elite covers a substantial portion of the gluteus maximus, though with splashing of surface water and passing vehicles on some waterlogged singletrack roads, the shorts were one part of the kit that did not even hint at remaining dry. the high collar of the jacket has an elasticated closing toggle, allowing it to be pulled close to the neck and preventing that awful rain down the neck feeling while on the bike. i cannot tell a lie; there was a light degree of dampness on the merino baselayer on my return (a very fine and exhilarating 25km), but none of which was due to rainwater. the elite jacket is probably as waterproof as you can get, a reputation well deserved of the event fabric. considering the relative mildness of the day, and the pace at which i had been pushing (be reasonable, there's only so long you can stay out in the rain), i would have been very surprised to have been completely bone dry on returning home; i, and many others, have yet to find a breathable jacket that can cope entirely with the degree of perspiration chucked out by the energetic cyclist. as i have mentioned on at least one prior occasion, on a perfectly dry day, a day that requires no hint of a waterproof, you'll find the jersey and baselayer to be damp with perspiration. what is it that makes us think that covering such apparel with a breathable waterproof layer will leave us completey dry under similar but rainly conditions? my gauge of a good breathable jacket is simply one that minimises the perspiration; it is unrealistic to expect to be drizabone when you step into the team bus (or kitchen, if we bring things more down to earth). in the grand scheme of things, the showers pass elite 2.0 jacket is at the very top of the tree. taking into account the degree of attention and design involved in this waterproof jacket, particularly the under-arm zips. if i were you, i would now beat a path to mr dalton's front door (or website, if you don't favour personal confontation) and offer him the necessary dollars before the weather gets any worse. the jacket sells for $220 (about £120 plus postage.) showers pass will cheerfully dispatch any item worldwide. had i maintained some degree of perspective on the season of cycle shows, i might just have managed to organise myself enough to take a trip to friedrichschafen for the big, bigger, and still gowing eurobike trade show. however, i didn't, and much like most of us, had to make do with the photos and news posted on the numerous, more organised websites (granted all with a larger budget than that of the post). however, phil burnett of mosquito bikes, is not only closer to germany than i, but a bit more perceptive regarding important dates in the cycling calendar, and has helpfully penned a few words about the exhibition. for this, i am extremely grateful, and have pixeled his contribution below. all photos from phil too (what a guy). "anyone who has been to a bike show in the uk would think that two days would be plenty of time to get to get to see everything, but after a frenetic 48 hours in germany, i left feeling there was more to see. 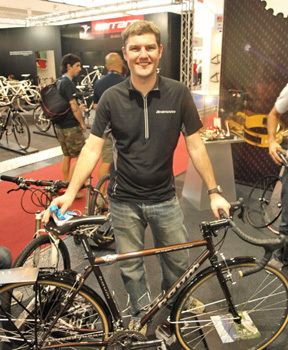 eurobike is now widely regarded as the biggest and most important in the world. and as joe ingram of independent fabrication was heard to say "man, this show is huge" - being european we had always looked across the atlantic in awe at the interbike show in las vegas, although i'm not sure friedrichschafen can match vegas in the 'entertainment' stakes. "anyway,here is some of the stuff we liked. "baum frames - beautiful creations in steel and titanium built in australia by darren baum, another of the growing worldwide band of small scale builders crafting frames with love, care and not a small amount of expertise. the frame names give away his love of coffee - ristretto, espresso, cappucino, cubano..
"milani cycles - celeste milani has to be one of the most enthusiastic guys in the bike business. milani dates back to 1927 and was set up by celeste's father enrico. on enrico's death in the 1990s, the firm became dormant and various taiwanese factories offered to buy the name. 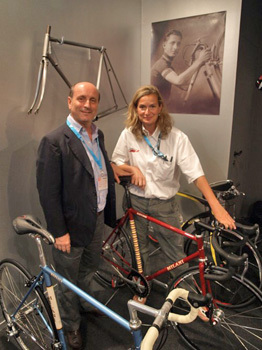 celeste was having none of this and last year frames once again began to be produced in the milani factory near milan. initially concentrating on carbon road frames (which can be custom built) the range has now expanded to include two beautiful steel models, the geared replica, and the single/fixed gear velocitaurbana. "bont shoes - custom shoes from australia, as used by the gb track squad in the olympics (to beat lots of australians!). these look good and are a step on from the semi-custom (uppers only) shimano system. a cast is taken of your foot and the shoe produced from the cast. it's going to cost a wee bit more and take longer than your average shoe purchase, but what price comfort? 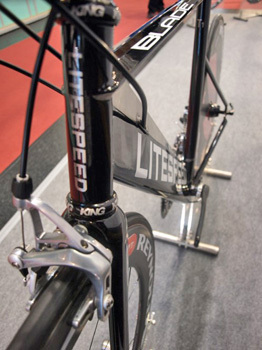 "litespeed/merlin - the litepseed blade has always been one of the top time trial bikes on the market but the new stealth looking model is likely to be at the top of the wish list for any aspiring triathletes and 'testers' (who have pockets to match). the merlin cielo makes a welcome return to the range, carbon/ti-lugged bikes seem to be quite the thing right now. "independent fabrication - if didn't have a stand as such, but joe ingram popped over from the factory to be on his german distributor's stand. it was good to see the if 953 range expand to include a 'cross bike; the durability and ride characteristics of 953 should suit the discipline well. 953 seems to have really caught on in the states (less so in the uk), the main problem joe has, is in getting enough of the stuff. "mavic - a big change for the french manufacturer as they launch a range of clothing and shoes (they previously worked with adidas) and from what we have seen, they are kicking off with an impressive range, many will have spotted valverde's natty looking pair of yellow mavic shoes in the tour, pity he didn't get the jersey to match. "pmp - we have always liked these beautifully engineered components from italy - a nice alternative to some of the more everyday brands. the chainsets are to die for!